Friday evening saw us heading off to Derby cathedral ( a building which I absolutely love) for a Christmas brass band concert performed by Derwent Brass and the Derby Central Salvation Army Band. As you would expect, it was a truly lovely evening – plenty of rousing festive music with the opportunity to join in with some of the carols – sooo Christmassy! 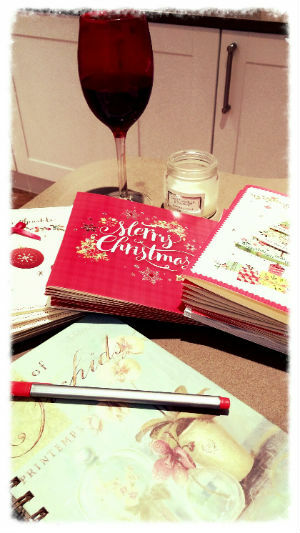 I eventually got around to writing our Christmas cards on Saturday – not my favourite festive activity but certainly helped this year by listening to Christmas music and drinking mulled wine at the same time. On Sunday, D, G and I went to the local Christingle service, which was really nice (G particularly enjoyed the fact that the Christingles were decorated with just sweets rather than raisins!) – and we even managed to come away with a spare Christingle for B.
I seem to have had some lovely, but very wet, walks with the dogs this week. Honey seems to have had lots of energy recently, so I’ve given her plenty of time off her lead running crazily around in the water-logged field. Catching up with friends has been a real highlight this week. Christmas gives us the great opportunity to meet up to swap gifts, which I did with different friends on Tuesday and Thursday this week – a real treat to spend time with them. Honey has been particularly cute this week! I bought her a new Christmas toy which I just happened to see in passing on Tuesday, and she absolutely loves it! Whenever D comes home from work or downstairs in the morning, she rushes to get it and run around him with it, as if she is showing it to him – adorable! A quick trip into TK Maxx on Tuesday proved very fruitful – I came away with a very large, red, Christmas bowl – exactly what I had been looking for to put chocolates into – and two fabulous-looking candlesticks for the table. These will be lovely adorned with some holly and ivy for next week, but also are pretty stunning on their own all year round, so I was very happy with my purchases. Christmas baking! 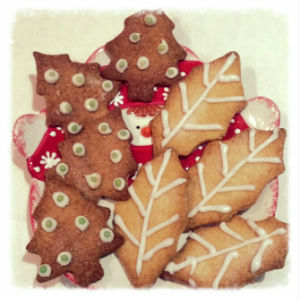 I love this time of year for providing an excuse for baking – not that I normally need one! So this week I have made shortbread and cinnamon shortbread Christmas biscuits and marzipan crumble-topped mince pies – yum! Yesterday marked the beginning of the Christmas holidays for us, as I went up to collect B from school. The day worked out really well – I was able to take a Christmas posy up to my parents’ grave, see a friend for tea and a chat, and then drive to Lancaster with time to walk the dogs before picking up B. We had a great return journey and were home by 4.30pm – lovely to have him back home! 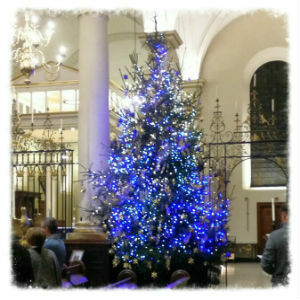 So today holds the final highlight of the week – G finishing school for Christmas! Then we can really start getting festive together, as we have lots of lovely things planned for the next week. I hope that you all have a lovely, and not too hectic, final weekend before Christmas! 1.We had our work Christmas Party on Saturday night, which was a great evening! 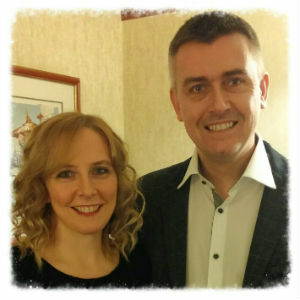 We went to a new venue this year – Alton Towers Hotel – and everything was fabulous, from the stunning Christmas decorations to the delicious food to the great atmosphere, with lots of eating, drinking and dancing going on until the early hours. A great time was had by all! 2. 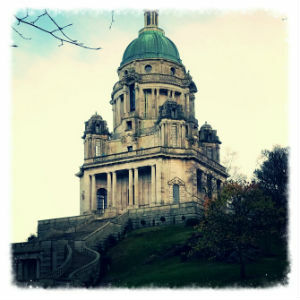 Compared with certain areas of the country, we were very lucky here in Derbyshire that we didn’t suffer any adverse weather conditions, but things weren’t so rosy up in Lancashire, where B is at school. They were without power for two days, and the day school was closed on Monday and Tuesday, but the boys seemed to treat it as a great adventure – encouraged by the fantastic staff. Brunch was cooked over a fire on Sunday and pool was played by torchlight; day staff came in on Monday to give the boarders a morning of sports activities; and they were then taken on a shopping trip to the Trafford Centre for a change of scenery on Tuesday. Apparently the boys were all brilliant during these trying circumstances but a very special “thank you” goes to the staff, who looked after them absolutely fantastically. 3. This week has seen plenty of deliveries coming my way, so I have spent a lot of time wrapping presents – which I absolutely love to do! 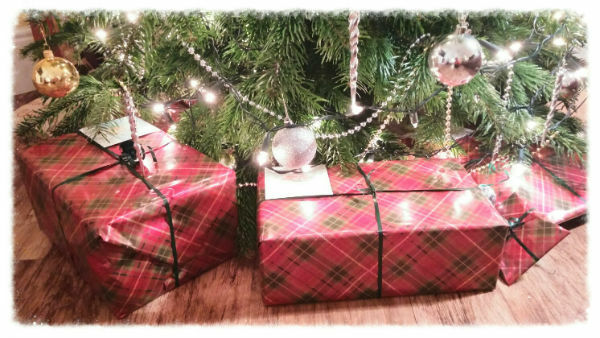 This year’s wrapping theme is tartan paper with red or green ribbons, which looks very festive. 4. 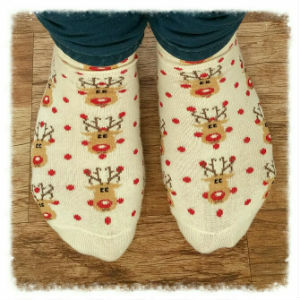 Due to the fact that it is now only two weeks until Christmas, some of my festive attire has made an appearance – Christmas socks, jumper and earrings have all been worn this week! 5. 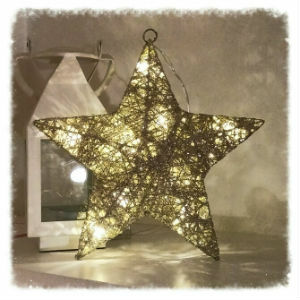 One of my favourite purchases of the week has to be the new Christmas star decoration which I bought on Wednesday. Isn’t it great? And only £5 from Primark! 6. We got the good news this week that G has passed her grade 7 piano exam, which she took a couple of weeks ago. Well done, G!! 7. 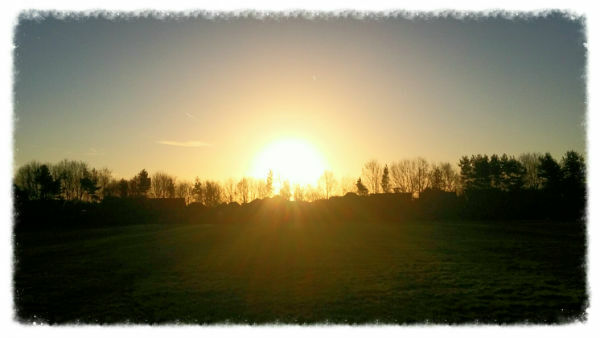 It has been a pretty wet week on and off yet again, but I managed to get a lovely sunny walk in early on Wednesday morning, which was beautiful. 8. 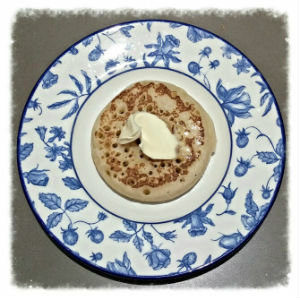 Crumpets! I spotted some crumpets when I was on my way into the Co-op during the week and was suddenly struck with a craving for them! We haven’t had them since we introduced our French exchange friends to them in the summer – delicious! 9. It is looking as though G’s knees are on the mend at last, which is great news. She has been suffering with them since about March this year and we have been having regular trips to the physiotherapist for them, but she now only needs to go back if they get worse again. They aren’t completely right at all, but are much better than they have been so hopefully they will be back to normal soon. 10. Christmas fiction! I love the fact that you can get Christmas novels at the library or on special offers for the Kindle at this time of year, and I love to read this kind of thing throughout December, so I’ve been loving getting into the Christmassy spirit this way too! We are off to a Christmas Brass Band concert tonight at the cathedral, which I am so looking forward to – you can’t get much more festive than that, can you? Thank you for reading and I hope that you all have a lovely weekend. All together now – “It’s beginning to look a lot like Christmas!” Hurrah for December – probably my favourite month of the year – so this has been a good week! 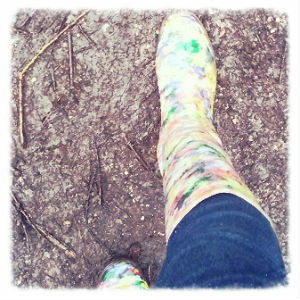 1.One definite highlight of the week happened last Friday, on my way to collect B from school. I had made an arrangement to pop in to visit a lovely lady called Eileen, who was the Brown Owl when I helped at the village Brownie Pack for several years, as well a being a good friend of my parents. I haven’t seen her for over eight years, but I’d spoken to her on the phone the previous week, and she sounded exactly the same, so I was really looking forward to seeing her. However, when I arrived, not only was it lovely to see her, but she had also arranged for the two others who ran the Pack at the same time, Margaret and Linda, to be there too. What a great surprise! And none of them had changed a bit! It honestly made me so happy to spend that time with them, and reminisce and catch up on what they, and their children, are now up to. So much time had passed, but it could have been only yesterday that I had last seen them. What a fabulous start to the weekend! 2. This was followed by collecting B, who was home for three days, as his school had an inset day on Monday, so, as always, it was absolutely lovely to have him back with us. 3. The only downside to the weekend was that G was away from Friday until Sunday afternoon at cadet camp, so we didn’t have the whole weekend as a family, but I was so proud of the fact that G was so keen to go, not really knowing many of the other cadets that well and it being her first camp. 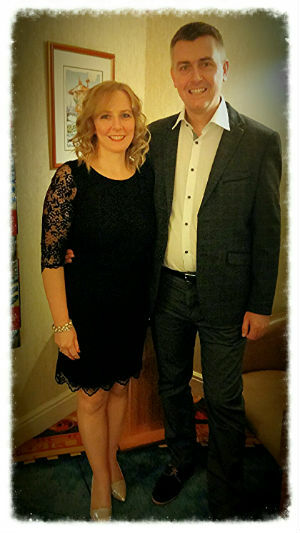 She had a fantastic weekend and loved every minute – well, apart from the disco on the Saturday night, of course! 4. D and B went out for the afternoon on Saturday, having a “boys trip”, which gave me the opportunity to have a really long catch-up on the phone with one of my closest friends. It’s always so good to have a proper chat. 5. 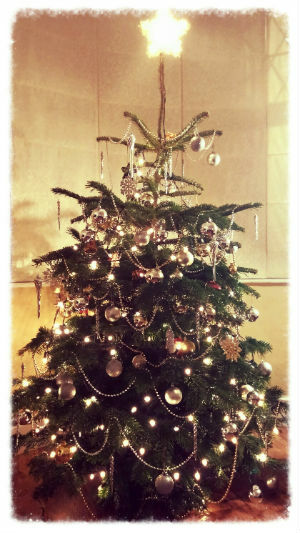 Sunday was Christmas Tree Day – despite the fact that it was by far the earliest we have ever put our tree up, but it had to be done, as B is now not home until the end of term. Plus it was the first Sunday of Advent, so most definitely allowed! I love to have a real tree, and decorating it, with the mulled wine flowing and the Christmas music playing, has to be one of the highlights of the festive season. 6. Sunday also saw me and D going to church. I had been looking for a church in which I thought that I would feel comfortable for a little while, and we came across a possibility when we were in Mickleover for Remembrance Sunday, so decided to go to one of the services. It was exactly what I had hoped for – very traditional, so we knew the format of the service and “what to do”, and everyone was really friendly, so we will definitely go back. 7. 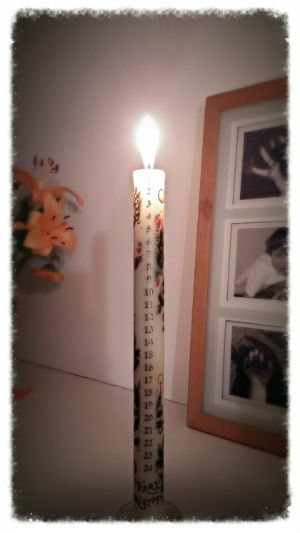 So December began on Tuesday, so out came the advent candle, which I have had waiting for the past few weeks. A definite sign of Christmas – lovely! 8. We had G’s Parents Evening on Wednesday, which, as usual, was lovely. Even though she always seems to do very well, it is still reassuring to hear directly from all of her teachers that she is working hard and has made a fantastic start to her GCSE courses. A complete star! 9. Similarly, we received B’s school report on Thursday, which was great – with him being away, we don’t get to see his school books, to see teachers’ marks and comments, so it was really helpful to get this update on his progress. It was very positive indeed, especially pleasing to see that he seems to be trying hard in almost every lesson, and with some useful tips and targets to work on. 10. My new car arrived on Thursday, which is very exciting! Although I am really sad to see my old car go, as I absolutely loved it, I’m really happy with my new one – and am currently loving that new car smell! We have a bit of a mixed weekend ahead, as it is D’s grandma’s funeral today, which will obviously be a poignant occasion, but this is then followed by our work Christmas Party on Saturday night – what a contrast. I hope that you have a good weekend, whatever you are up to.